The Whale Shark is the largest fish in the ocean. Weighing in at up to 20+ tonnes, it can grow to lengths in excess of 14m – a true ocean giant. But a gentle one. It may have a huge mouth, and can present quite an arresting sight for divers & snorkellers when it cruises along, mouth open, just below the surface. But it is a filter feeder, so cannot eat a snorkeller even if it wanted to! It eats mainly plankton which it funnels through its system with its huge mouth, extracting its food using sieve-like gill rakers on its belly. Whale Sharks are thought to live to over 70 years old, and do not reach sexual maturity until around 30. We know little about breeding & birthing practices of Whale Sharks but they produce live young which are less than 50cm big at birth. Tofo lies in the heart of a stretch of waters known as The Manta Coast, and for good reason. There are excellent chances of spotting them on dives where most of the deep sites have 'cleaning stations', as well as on the surface during Ocean Safaris. They have, proportionally, the largest brain of any fish, and we truly believe that you can see evidence of this when you look into their eyes during a close up 'moment' with these creatures; which is more than possible on a dive here in Tofo. Most of our deep dive sites have Manta cleaning stations on them; which are spots on the reef that they visit in order to be cleaned of parasites by small reef fish. When this occurs divers have a chance to observe these beauties close up for extended periods of time; an unforgettable experience. Here in Tofo we have the Giant Manta (Birostris), with a wingspan of up to 7m, and the Reef Manta (Alfredi) which is usually up to around 5m. Turtles have to be one of the most prized sight for divers of all levels around the world. So diving in Tofo is very rewarding. We have 5 resident species here; Green, Hawksbill, Loggerhead, Olive Ridley and Leatherback. The most common sightings are definitely Loggerhead and Green. They can be seen on any of our dive sites and make for great photos. Ocean Safari guests often see them on the surface as they bob up for air, since they are a reptile and must breathe to survive. Possibly the most impressive sea turtle that Tofo has to offer is the enormous Leatherback Turtle. It is the largest marine reptile in the world, and is comparable to a VW Beetle in size! We tend to see these beautiful monsters after periods of rough seas which brings in their main source of food – jellyfish. So what may not be so great for swimmers is definitely good for turtle lovers! Every year from around June until November, Tofo waters come alive with the spurts & splashings of Humpback Whales. Thousands of these oceanic giants have swum the hundreds of miles up from their summer feeding grounds in Antartica to our warmer waters to breed and give birth. Watch them breach, slap their pectoral fins, roll, spyhop over and over until they get it just right. Scientists remain unsure of exactly why Humpbacks are so energetic; it has been suggested that the acrobatics are a means of communication, or possibly a hunting & feeding strategy. Whatever their purpose, these sights are an absolutely unforgettable added bonus to our Ocean Safaris. Everyone loves dolphins, they can not fail to make you smile. The most common species here in Tofo is the Bottlenose Dolphin. They travel in groups known as pods and get up to a speed of 12 kmph. They communicate and find food by using a technique called echolocation, a clicking noise that can be heard underwater. They're very social mammals so make sure you listen out when you're on your snorkel! The best way to see them is on one of our Ocean Safaris, and if you are quick enough you may even get to swim with them. Diver visitors to Tofo have good chances of shark encounters on dives, especially when diving the northern sites like Office and Reggies. The most common shark we have is the White Tip Reef Shark which we usually see lounging around in groups in sandy areas or chilling out under overhangs on the reef. These guys are totally harmless and are more likely to be spooked by curious divers than the other way around. 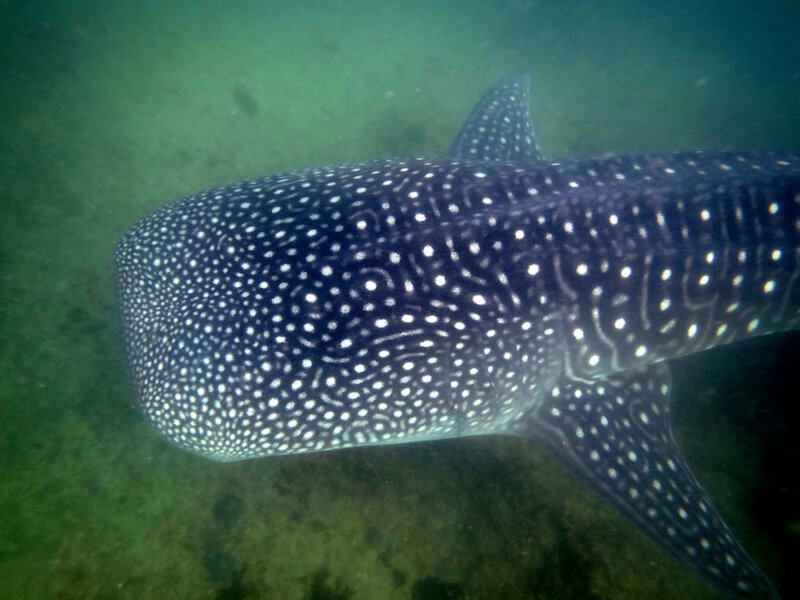 Another favourite is the Leopard Shark; easily identified by its spots and very distinctive rounded nose and long tail. They don't tend to be long distance swimmers, and so on certain sites like Reggies we can often find them as local residents. Grey Reef Sharks haunt certain deep sites, and are very typical of what most people think of as an example of what a shark looks like; stocky, stout, blunt nosed, with large beady eyes. They are very active as well as curious, so encounters are often brief, but exciting none-the-less. Bigger species of shark such as Scalloped and Great Hammerhead, Tiger, Bull and even Great White have been recorded in Tofo's waters, but the chances really are small, so if it happens consider yourself very lucky indeed, and for those of you less enamoured of sharks you really do have nothing to fear diving here in Tofo! Tofo is definitely blessed when it comes to rays. Besides the undisputed king; the Manta Ray, we have many many other species to be proud of. We are lucky enough to be one of the few places in the world to count the rare Smalleye Stingray as a resident species. This is the largest stingray in the world, and can grow to over 2m across. It is has a distinctive diamond shape and tan colouring with white spots and cruises around up in the water column. They often visit the same cleaning stations as Manta Rays and for divers there are excellent chances of encounters on Giants Castle dive site. Devil Rays are the mini-me cousin of the Manta, and they frequently enliven safety stops as flocks of them show off with their synchronised displays. Sometimes they even hook up with Cow-nosed Rays to form huge schools of maybe 50 or more. And these are the guys which love to jump. They fly out of the water performing acrobatic flips to the delight of many an eagle-eyed Ocean Safari guest. On the reef, divers are treated to a host of other species from the commonly sighted small Blue Spotted Kuhls Ray, to the larger Jenkins Whip Ray and Blotched Fantail Ray. These guys scoot around the reef stopping off to whip the seabed up to turn up small crustaceans on which they feed. Possibly one of the coolest creatures you will see in Tofo's waters is the Bowmouth Guitarshark. Despite its name it is actually a ray, but a ray that is kind of crossed with a shark! It has the head of a ray but a sharks body & tail. They are rare, but we are lucky here as they can be spotted with some frequency on our deeper reefs like Giants Castle, Office or Rob's Bottom.